I know we had there the "0 trophy bug", but I thought that it's fixed, but no - it's not. And now, i had the same bug the third time in only a few days... What happens here? I lost all the mana and minions and get nothing? At the end from fight it only shows "Verbindung zum Server verloren" and goes back to the Dungeon. It's the 0 trophy bug. No, the opponents have much more trophys. The have 10k and more. I attacked one where i had the bug twice this weekend. At the second time there was no bug. We're still looking for repro cases, so if this happens to anyone please send me the information requested from the main post. Due to the nature of the bug, we need immediate cases. 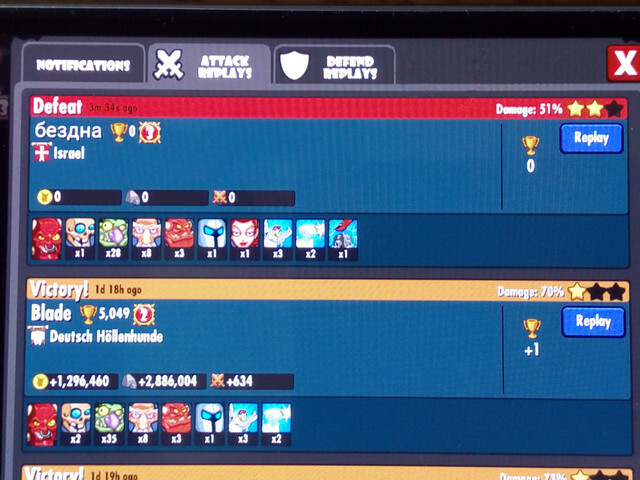 If you send us an report after the replay has been overwritten (after 5 attacks), we will lose its history and be unable to retrieve the logs.